Tapir: White may try some stunts like this. But it should not work. And it is no shame to resign in a handicap game, especially when your opponent killed two huge groups already (with or without help). Joelr: I need a misstep from Black here, but I'd rather cut than peep. I don't know if Wa, Br is a way to induce the wrong . MrTenuki: I agree with Tapir that resigning as White might make more sense. Also, at in the second diagram seems to save the two stones. tderz: wow! That's an interesting tesuji which I know but overlooked. Also it wouldn't help the white upper right group to capture stones on the bottom. With regard to resigning - first White can put Black a bit more to the test. Gano: At a glance, I thought white had something at with 1, but recalling the position later I realized there's nothing of note. White can't play "a" because he has too few liberties to do anything useful. 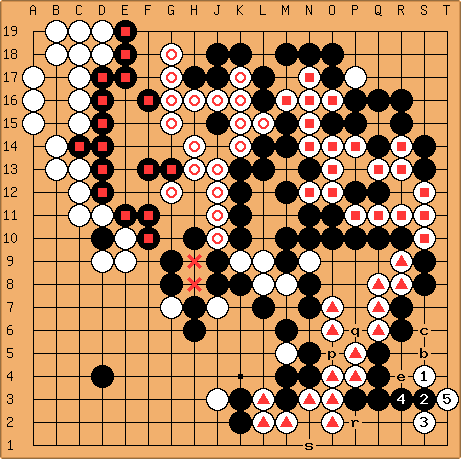 And if white plays "b", then black will play "a" and it seems there's little that white can do. At first I was uncertain where to place , but this should be adequate. 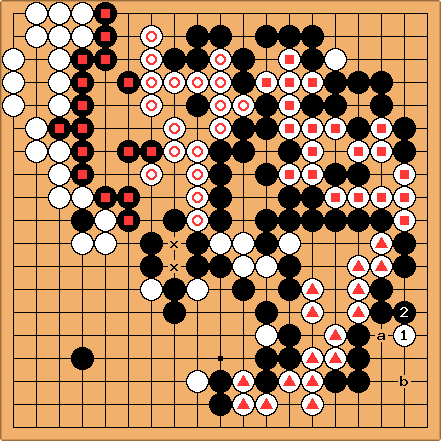 With this, I can only see white achieving a false seki. tderz: White started at the 4-2 point. Some of Black's responses do not work, but Black can refute. tderz: Responses A and B spring to mmind. Both defend against tesuji C, which would enable White to capture 2 stones and link both groups. tderz: White tried to confuse with . Black could contemplate D or E to keep White short on liberties and avoid white tesuji C.
tderz: It can easily become complicated after . 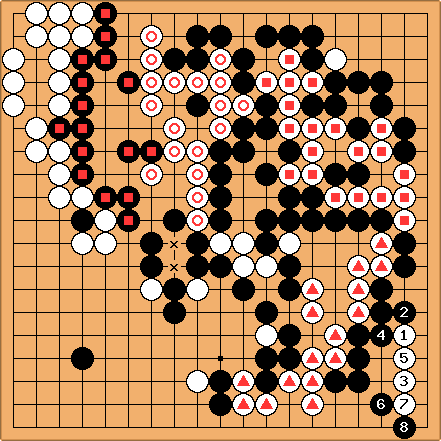 One outcome might be a triple seki between , the black stones and the corner. If White achieves that in sente, she doesn't make points, yet has a tempo to make alive. unkx80: I don't understand. is already alive. If White manages to get a seki in the corner, then it would be a false seki anyway, because would be dead. tderz: Of course your are right about the false triple seki. Also I wrote 'The position is quite correct, I'm at present not very sure about the K2,3 stones, ...' which is true, as it looked worse in real. I am still waiting for a picture taken by Marc at that moment of the position in dicussion. I will then add the corrected SGF. 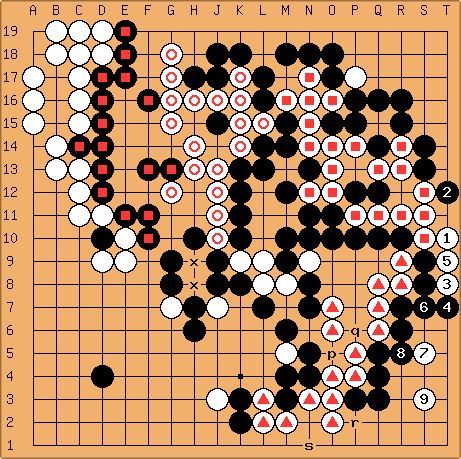 http://eidogo.com/#1Z9uxc8 position (continuation) + start of game (scroll down in EidoGo), however the position around K2 is still flawed, as it was a fast game after all.